A few more feet to the right and this would have been the Josh Rutledge Miracle Game. After tallying once off so-called 'Uber-Closer' Aroldis Chapman (who didn't hit 100 MPH on any of his 30 pitches in the 9th inning), Boston was poised to win it with two on and two out in the final frame. 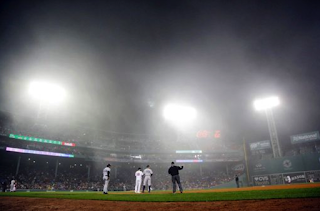 Rutledge—playing for the injured Panda—roped a Chapman pitch high into the foggy night down the left-field line. Even the cretinous Yankee fans thought it was over. Alas, it went foul and another pretty decent Rick Porcello performance went down the tubes, 3-1. The one highlight was Mookie Betts slamming a double off Chapman to set up the potential winning rally. Tomorrow, Sox ace Chris Sale looks to slay The Bronx Embalmers.